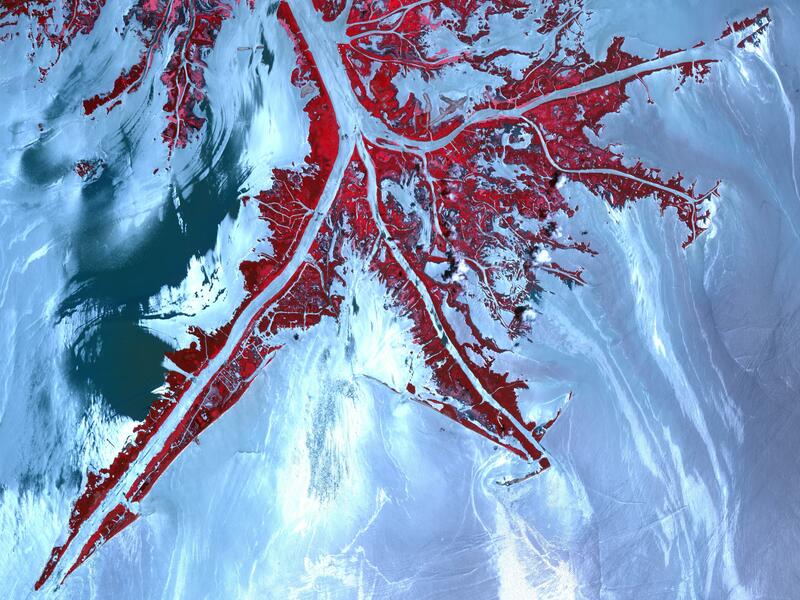 On May 24, 2010, the Advanced Spaceborne Thermal Emission and Reflection Radiometer (ASTER) instrument on NASA's Terra spacecraft captured this false-color, high-resolution view of the very tip of the Mississippi River delta. Ribbons and patches of oil that have leaked from the Deepwater Horizon well offshore appear silver against the light blue color of the adjacent water. Vegetation is red. In the sunglint region of a satellite image--where the mirror-like reflection of the sun gets blurred into a wide, bright strip--any differences in the texture of the water surface are enhanced. Oil smoothes the water, making it a better "mirror." Oil-covered waters are very bright in this image, but, depending on the viewing conditions (time of day, satellite viewing angle, slick location), oil-covered water may look darker rather than brighter. The relative brightness of the oil from place to place is not necessarily an indication of the amount of oil present. Any oil located near the precise spot where the sun's reflection would appear, if the surface of the Gulf were perfectly smooth and calm, is going to look very bright in these images. The cause of the dark patch of water in the upper left quadrant of the image is unknown. It may indicate the use of chemical dispersants, skimmers or booms, or it may be the result of natural differences in turbidity, salinity or organic matter in the coastal waters. what exactly is beneath the surface of that murky stream? That lack of information is giving way to advances Kaeser and DNR GIS specialist Thom Litts have made translating imagery from a blue-collar, side-imaging sonar unit into a GIS layer that probes the underwater side of streams. Kaeser and Litts have published their findings in American Fisheries Society journals (December 2008 and April 2010), trained some 200 people in using the sonar and scaled their methods to suit the most common level of ArcGIS. They are also providing software tools needed to process the sonar imagery for free. Results from the habitat mapping initiative offer biologists with limited training a low-cost, relatively fast way to document wood, substrate and other habitat in navigable streams. The side-scan sonar method is already being used to explore habitat preferences of state-listed Barbour’s map turtles in southwest Georgia’s Ichawaynochaway Creek, search out spawning sites for the rare robust redhorse in the Ocmulgee River and study habitat relationships between three bass species in the upper Flint River. For the Auburn University bass study on the Flint, Kaeser and Litts covered nearly 15 miles of river in one day and produced the map in a week. Traditional methods – measuring habitat along transects and extrapolating findings to the entire area – would have taken several weeks, or longer. Using side-scan sonar was once the realm of deep-water marine research with tow-behind-the-boat units worth tens of thousands of dollars. But Litts and Kaeser use a Humminbird 900-series Side Imaging system priced at less than $2,000. They motor along the middle of a stream at 5 mph, taking depth readings and sonar “snapshots” that reach from bank to bank. Computer programs piece together the digital images, a process Litts wrote tools for and smoothed out the remaining kinks. It takes time to interpret the imagery, which looks like a moonscape, with boulders as bumps and logs as lines. Accuracy is confirmed through field spot-checks. The images taken by sound instead of light are rich in detail. “We’re on our third or fourth generation of refinement,” Litts said. But they are definitely on to something. Kaeser envisions a biologist on a blackwater stream pulling up the data on his smartphone. “I think you’re going to see an explosion” in use, Kaeser said. Freediver champion Guillaume Nery proposed an unique performance at Dean's Blue Hole (Long Island, Bahamas) the deepest blue hole in the world (202 m - 663 ft). Blue Hole is not only the breathtaking location of this artistic concept video, but it is also the site of Guillaume's successful constant weight (CWT) national French record dive to 115m. In the same competition in Dean's Blue Hole (April 2010), Herbert Nitsch moved the world CWT record (deepest self-powered freedive of all time) to 124m. Another impressive feat - the exquisite footage in this video piece was entirely filmed on breath hold by Julie Gautier, who is also herself a French freediving champion. Apnea is an inner journey, a positive introspection. Electronic tagging and fisheries catch data have revealed pronounced differences in preferred habitat of Atlantic bluefin tuna and yellowfin tuna in the Gulf of Mexico, despite their close ancestry, according to a new study published today in the peer-reviewed journal PLoS ONE. Bluefin tuna return to the same regions of the Gulf of Mexico during spring months to spawn. The bluefin are selecting a particular habitat along the slope waters of the Gulf of Mexico, which has unique oceanographic properties that are predictable and can be seen from satellites. Yellowfin tuna are more widely distributed throughout the warm Gulf waters and occupy the region throughout the year. "The bluefins' habitat requirements are relatively exact so we can predict with reasonable accuracy where bluefin tuna are likely to be spawning at any given time based on oceanographic data continually being gathered by satellites and weather buoys," said lead author Steven Teo of the University of California at Davis. "This is in stark contrast to yellowfin tuna, which exhibit much more generalized environmental preferences." The fidelity to breeding areas over time detected in this study is reminiscent of salmon returning to their natal stream to spawn. Bluefin tuna are among the most valuable fish in global markets. The International Commission for the Conservation of Atlantic Tunas (ICCAT) currently manages the Atlantic bluefin tuna as two distinct populations, with western Atlantic spawners of the Gulf of Mexico forming a distinct population genetically from the eastern spawners of the Mediterranean Sea. The western Atlantic stock has suffered a significant decline in spawning stock biomass since 1950, and a 20-year rebuilding plan has failed to revive the population or the North American fishery. The failure of the Gulf of Mexico spawning population to rebuild, as well as the scope of illegal and under-reported catches -- particularly in the Mediterranean Sea -- are of such major concern that the species was recently considered by the United Nations for endangered species listing in March of 2010. Targeted bluefin fishing has been banned in the Gulf for over twenty years, but bluefin continue to be captured accidentally on pelagic longlines, often resulting in mortality. The study shows that bluefin tuna are captured in the Gulf of Mexico from January through June each year, and the highest pelagic longline catch rates are in April and May, during the bluefin spawning season. The authors compared environmental preferences and spatio-temporal distributions of bluefin and yellowfin tuna as revealed by pelagic longline catch rates and scientific tagging cruise conducted by the Stanford University and Monterey Bay Aquarium team coupled with oceanographic data sets. Drawing on these data, a model was developed to determine the relative probability of catching bluefin and yellowfin tuna at a given place and time. This model showed that there are two major hotspot regions within the Gulf where bycatch occurs -- one in the eastern Gulf of Mexico to the north of the Loop Current, and the other in the western Gulf of Mexico. Both regions are along the slope where the shallow continental shelf depth changes rapidly to the deep sea. It is within these hotspots that bluefin tuna prefer to spawn in circular, swirling water masses called "cyclonic eddies." These eddies are more productive and slightly cooler than surrounding warm Gulf ocean currents. Yellowfin tuna, however, are much more widely dispersed throughout the Gulf of Mexico throughout the year. These findings indicate that it would be possible to utilize spatial management techniques to protect western Atlantic bluefin tuna on their breeding grounds in the Gulf of Mexico without compromising the yellowfin tuna fishery, which could be carried out in other areas during the critical bluefin tuna breeding times. Unfortunately, these findings also give cause for concern in light of the recent Deepwater Horizon oil spill. "Both catch data and electronic tags indicate the Gulf of Mexico along the continental shelf is the preferred habitat of this majestic fish. I think it is amazing how precisely we can predict where the bluefin are. Unfortunately their spawning habitat overlaps the Deepwater Horizon oil accident site, and the timing of the spill coincides with the time when we expect them to be there spawning" said senior author Dr. Barbara Block of Stanford University. MarineMap is a web-based decision support tool for open and participatory spatial planning in the marine environment. MarineMap offers a simple, flexible and powerful means of gathering expertise from resource managers, scientists, stakeholders and public in a process of collaborative decision making. The MarineMap Consortium brings together personnel and skills from UC Santa Barbara, Ecotrust, and The Nature Conservancy. They create open-source spatial tools that integrate and illuminate the human dimensions of marine science and policy. The 1999 Marine Life Protection Act directs the state of California to design and manage a network of Marine Protected Areas (MPAs) in order to, among other things, protect marine life and habitats, marine ecosystems, and marine natural heritage, as well as improve recreational, educational and study opportunities provided by marine ecosystems. Actually, MarineMap is a mashup of the California coastline and MPAs. The map has a large number of features and manages to include a massive amount of data. The stated aim of MarineMap is to assist organizations involved in mapping of the oceanographic, biological, geological, chemical, and human dimensions of the ocean and coastal areas. They provide organizations with customized solutions for data storage, data sharing, and web-based mapping. "Because such a diverse range of organizations and individuals have a stake in marine habitat protection, it is critical that MarineMap be accessible to individuals without technical GIS training. MarineMap allows residents to define scientifically defensible MPAs in a collaborative manner. "An absolutely critical component to this project is the ability for users to share their proposed marine protected areas and analyses with other stakeholders. Stakeholders can then collaborate and negotiate to come up with the best scenarios," said Matt Merrifield, GIS Manager for The Nature Conservancy. Whether a stakeholder is a fisherman, a scientist, or environmental advocate, each needs to be able to draw on a map the location of marine resources to be preserved," said Will McClintock, Marine Map Director at the UCSB Marine Science Institute. A couple of days ago, the U.S. Institute for Environmental Conflict Resolution awarded MarineMap the “Innovation in Technology and Environmental Conflict Resolution”. So 721 charts are now included in the UK layer. In this way, we plan to include a part of the available UKHO charts for South Africa, Spain and Portugal in our next update. The next generation of GPS satellites just began existence late Thursday night (see previous post link) with the launch of the new GPS 2F-1, a solar-powered satellite designed for a 12-year mission. This new satellite has twice the signal accuracy of previous navigation satellites, and the new constellation will also contain a next-generation international search and rescue system called the Distress Alerting Satellite System (DASS). The DASS alerting system is a combined effort by NASA, NOAA, the U.S. Air Force and the U.S. Coast Guard. The system is in testing now, with instruments aboard 12 satellites that can detect the 406 MHz signal that is generated from beacons on aircraft, vessels and individuals. The new system can accurate locate the beacons almost immediately using only the frequency signal, overcoming a limitation of the previous system that required an unrealiable GPS signal to assist in determining location. NASA, which pioneered the technology used for the satellite-aided search and rescue capability that has saved more than 27,000 lives worldwide since its inception nearly three decades ago, has developed new technology that will more quickly identify the locations of people in distress and reduce the risk of rescuers. The Search and Rescue Mission Office at NASA's Goddard Space Flight Center in Greenbelt, Md., in collaboration with several government agencies, has developed a next-generation search and rescue system, called the Distress Alerting Satellite System (DASS). NASA, the National Oceanic and Atmospheric Administration (NOAA), the U.S. Air Force, the U.S. Coast Guard and other agencies, are now completing the development and testing of the new system and expect to make it operational in the coming years after a complete constellation of DASS-equipped satellites is launched. When it goes online, DASS will be able to almost instantaneously detect and locate distress signals generated by 406 MHz beacons installed on aircraft and vessels or carried by individuals, greatly enhancing the international community's ability to rescue people in distress, said NASA Search and Rescue Mission Manager David Affens. This improved capability is made possible because the satellite-based instruments used to relay the emergency signals will be installed on the U.S. military's Global Position System (GPS), a constellation of 24 spacecraft operating in mid-Earth orbit (MEO). Under the current system, which first became operational in the mid-1980s as part of the international COSPAS-SARSAT system, the so-called "repeaters" are placed on NOAA weather satellites operating in low-Earth (LEO) and geostationary orbits. Although it has proven its effectiveness, as evidenced by the number of persons rescued over the system's lifetime, the current capability does have limitations, Affens said. The LEO spacecraft orbit the Earth 14 times a day and use the Doppler effect to help pinpoint the location of the signal. However, a satellite may not be in position to pick up a distress signal the moment a user activates the beacon. NOAA's geosynchronous weather satellites, on the other hand, orbit above the Earth in a fixed location over the equator. Although they do provide continuous visibility of much of the Earth, they cannot independently locate a beacon unless it contains a navigation receiver that encodes and transmits its position. Emergency beacons are offered both with and without GPS location data. Furthermore, the beacon-to-satellite link can be obstructed by terrain. DASS overcomes these limitations, said Mickey Fitzmaurice, space systems engineer for the NOAA Search and Rescue Satellite-Aided Tracking (SARSAT) program, the organization that operates the U.S. component of the COSPAS-SARSAT system now comprised of 40 nations. "With a mid-Earth orbit search and rescue capability provided by GPS, one emergency signal goes off, and six satellites will be in view," he said. "Almost instantly, I can begin processing the signal to determine its precise location. Right now, it can take an hour or more before we can even act on a signal," he said. Goddard began work on the new system in 2002, a few years after studies revealed that repeaters placed on a constellation of satellites operating in mid-Earth orbit would significantly enhance search and rescue efforts. With NASA funding, Goddard engineers developed a proof-of-concept instrument and worked with the Air Force to fly it on GPS satellites to demonstrate and evaluate its effectiveness. Currently, nine GPS satellites are flying the proof-of-concept technology and an additional 12 are planned. Goddard is using the testing to fine tune the technology before transitioning to a final system after 2015, which will be deployed on the Air Force's Block III GPS satellites. As part of their research and development effort, Goddard engineers also designed and built a new ground-tracking station on the Goddard campus to receive, decode, and locate the 406 MHz distress beacons worldwide. NOAA plans to use the design when it begins constructing a DASS ground station in Hawaii next year and perhaps another in Florida in the future, Fitzmaurice said. The U.S. will not be alone in using mid-Earth orbiting spacecraft for its search and rescue instruments. Europe has begun development of a search and rescue capability on its Galileo system, Russia, its GLONASS system, and China, its Compass system. All are modeled after the NASA-developed DASS. "DASS technology is the future of international satellite-aided search and rescue," Affens added. "A few years ago, we looked to see how we could improve the system and we concluded that the international search and rescue community would benefit from new technology installed on GPS. We would be able to identify distress signals faster and with a greater level of precision. In the end, this will save more lives, reduce risk to rescuers, and save money because less time will be spent searching." NOAA, as the lead U.S. agency for the SARSAT program, maintains a national registration database of 406 MHz emergency beacons. "The database is a vital part of the SARSAT program and is used to expedite the search process, especially if the location of the beacon is not immediately known," said Mickey Fitzmaurice, space systems engineer for the NOAA SARSAT program. Should NOAA receive an alert, the agency can contact names listed on the database to validate the signal and get probable locations of the person in distress. This enhances the overall rescue coordination process and prevents unneeded rescue attempts if the beacon is accidentally activated. Although commercial vessel and aircraft operators are required by law to carry emergency beacons, recreational users are not. However, anyone who owns an emergency beacon is required to register their names, addresses, vessel or aircraft information and emergency phone numbers with the registration database. Fitzmaurice encourages recreational boaters, aviators, and hikers to buy beacons and register their information to help assure rapid rescue. Researchers at Durham University have drawn up new maps to show the competing claims of Argentina and the UK for resources in the South Atlantic and Southern Oceans. The publication of the maps follows the discovery of oil south of the Falkland Islands by a British company, Rockhopper Exploration, and a series of historical arguments about sovereignty and the rights to resources in the South Atlantic. Argentina and Britain went to war over sovereignty of the Falklands (also known as Islas Malvinas in Spanish) in 1982, and despite the former's surrender, the South American state has maintained its territorial claims to the islands. In December 2009, Argentina passed a law declaring its sovereignty of the islands and other British overseas territories in the region. 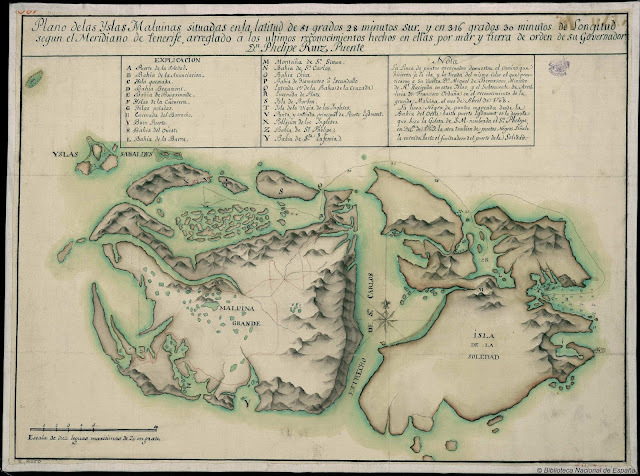 The Durham map was compiled using data from a variety of sources, including the submissions of the two states to the United Nations Commission on the Limits of the Continental Shelf. Specialist mapping software (Caris LOTS) was used to construct the jurisdictional limits depicted on the map. The decision by Durham University to comprehensively map the claims in the area highlights the complicated issues that remain following the British defeat of the Argentineans almost 30 years ago. The information is the first ever comparative map of resource claims in the region. Director of Research at Durham University's International Boundaries Research Unit (IBRU), Martin Pratt said: "The map is designed to show the extent of the competing claims between the UK and Argentina and highlights the complications that exist in determining the claims for resources in the South Atlantic and Southern Oceans. "The islands generate rights over the resources of more than 2.5 million square kilometres of sea and seabed in the South Atlantic Ocean alone, and both countries have recently defined the areas over which they claim sovereign rights. IBRU's maps highlight the nature of those claims and identify the areas in which the claims overlap. With the search for oil in this area continuing to intensify, the potential for conflict over the sovereignty of the waters between Argentina and the UK remains high. Some oil companies estimate a potential 3.5 billion barrels of oil and nine trillion cubic feet of natural gas exist under the South Atlantic waiting to be extracted. A study by the British Geological Society suggested that up to 60 billion barrels of oil could lie beneath the seas to the north of the Falklands -- a similar-sized deposit to that in the North Sea. Martin Pratt said: "The discovery of oil in the North Falkland Basin is likely to exacerbate tensions between the UK and Argentina concerning sovereignty over the Falkland Islands, South Georgia and the South Sandwich Islands. "Although sovereignty over the islands remains the key issue, determining maritime jurisdiction around the islands -- and off disputed territory in Antarctica -- will be a complex and challenging task." Following British claims on the potentially highly lucrative deep sea oil fields within the islands' 200-mile economic zone, Argentinean officials have revived the country's claims to sovereignty over the Falkland Islands. In February 2010, British warships were on standby in response to rising tensions in the area over British firms exploring for oil. Argentina demanded a halt to the drilling which it deemed was illegal and imposed a permit restriction on ships approaching the islands.